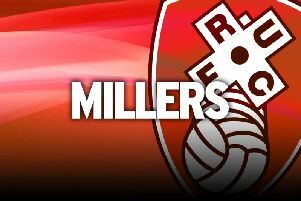 Rotherham have been struck with another injury blow after Ryan Williams has been ruled out for up to three weeks with a hamstring problem. The Australian suffered the injury in training last week and adds to an already lengthy injury list which is making Paul Warne's job even more tricky. Williams missed Saturday's 4-2 loss to Brentford. Warne revealed: “He had an accident at the training ground this week. His foot went over the ball and he stretched his hamstring. “Regrettably, he's out for two or three weeks. That limits us quite a bit because it leaves us with only two fit wingers at the club. Kyle Vassell is coming back but is obviously still rusty. Newelly (Joe Newell) is out for a few weeks. Williams' absence is at least off-set by the return of Vassell, who had been missing since December with a groin problem. He was a substitute against the Bees and taking his place on the bench means he looks set to have avoided surgery. “The physios say that his groin tests show he's got stronger as the week has gone on,” Warne added. “He was available for sub selection. When you're chasing the game, you may as well put on as many weapons as you've got on to the pitch. Matt Palmer also missed out against Brentford with an illness, but he could leave the club before the end of the transfer window anyway. Warne has also confirmed that Rotherham are no further on with trying to turn Richie Towell's loan move into a permanent one. The Millers were hoping to get the deal done by the weekend but it hit a stalemate. “We spoke to his agent and to Brighton about trying to sort something out,” Warne said. “As of yet, I have no news one way or the other. “Richie is pretty prominent in our team every week. It would be great if we could get him here permanently. “He's a good character in the dressing room. It would also allow me to not worry about him in the summer and allow me to bring in another loan player.